The global auto-injectors market is growing at a healthy pace and is predicted to witness a promising growth in the next few years. The emerging economies, across the globe, are likely to offer lucrative growth opportunities for the market players in the next few years. The rising use of biologics and the increasing incidence of chronic ailments are predicted to enhance the growth of the global auto-injectors market in the next few years. According to the market research study by Transparency Market Research, in 2013, the global market for auto-injectors was worth US$665.0 mn and is projected to reach a value of US$2.5 bn by the end of 2020. Furthermore, the market is estimated to register a strong 18.60% CAGR between 2014 and 2020. The increasing incidence of rheumatoid arthritis and the rising food allergies are the key factors that are estimated to encourage the growth of the global auto-injectors market in the next few years. The rising research and development activities and the advancements in the medical sector are further projected to accelerate the growth of the market in the near future. On the flip side, the high price of auto-injectors is projected to restrict the growth of the global market in the coming few years. Nevertheless, the rising disposable income of consumers in developing nations is expected to support the growth of the overall market in the coming years. The global auto-injectors market has been categorized on the basis of product type into fillable auto-injectors and prefilled auto-injectors. Among these, the prefilled auto-injectors segment is expected to account for a large share of the market in the next few years. The rising awareness among patients and the ease of use are the key factors that are estimated to accelerate the growth of this segment in the next few years. Furthermore, on the basis of manufacturing design, the global auto-injectors market has been divided into customized auto-injectors and standardized auto-injectors. The standardized auto-injectors segment is predicted to lead the market in the next few years; however, the customized auto-injectors segment is predicted to register a strong growth in the coming years. The global market for auto-injectors has been categorized on the basis of geography into Asia Pacific, Latin America, North America, Europe, and the Middle East and Africa. In the last few years, North America led the global auto-injectors market and is expected to remain in the similar position in the coming few years. The favorable government reimbursement policies and the presence of several key players are the major factors that are estimated to enhance the growth of the auto-injectors market across North America in the next few years. On the flip side, Asia Pacific is projected to witness a strong growth in the next few years, thanks to the rising awareness among consumers regarding the advanced treatment methods that are available in the market. The global market for auto-injectors is consolidated in nature with a few players holding a major share of the market. The key players in the market are focusing on the development of new product and innovations in order to maintain their dominance across the globe. In addition to this, the rising research and development activities is projected to accelerate the growth of the overall market in the next few years. Some of the leading players operating in the auto-injectors market across the globe are Antares Pharma, Inc., Pfizer, Inc., Becton, Dickinson and Company, Unilife Corporation, Mylan, Inc., Ypsomed Holdings AG., Novartis International AG, Biogen Idec, Inc., and Sanofi. Auto-injectors are used for the administration of a single dose of a particular (typically life-saving) drug. They are designed for easy use and intended for self administration or administration by any untrained personnel. This report provides an in-depth analysis of the global auto-injectors market. The stakeholders for this report include companies engaged in research and development, manufacturing, distribution, and commercialization of auto-injectors, and new entrants planning to invest in the auto-injectors market. The executive summary section of this report provides a snapshot of the auto-injectors market, which summarizes the market size, trends, and competition for different types of auto-injectors for various therapeutic applications on the global front. The market overview section elucidates market dynamics such as drivers, restraints, and opportunities that currently have strong influence over the auto-injectors market and could impact the future scenario of the market as well. Market attractiveness analysis has been included in the market overview section in order to explicate the degree of competition among major geographies. Porter’s five forces analysis is also incorporated in this section to explore the overall competition in the auto-injectors market, considering five different parameters that have an effect on the sustainability of companies in the market. The regulatory framework section highlights the standards and recommendations, set by various government organizations worldwide, which have strong impact on the auto-injectors market. Competition between major market players is analyzed along with their market share analysis in the competitive landscape section of the report. Value chain analysis has been provided to recognize the value-creating activities from a number of processes that take place in transforming inputs to valuable outputs. Event mapping is done for a brief understanding of the technological advancements, new product launches, and strategic decisions taken by players in the global auto-injectors market. All these factors assist the market players in taking strategic decisions, which help them in escalating their market share and strengthening their positions in the global auto-injectors market. The global auto-injectors market has been segmented on the basis of product, therapeutic applications, and manufacturing design. Based on product type, the global auto-injectors market is classified into two major segments, namely prefilled auto-injectors and fillable auto-injectors. 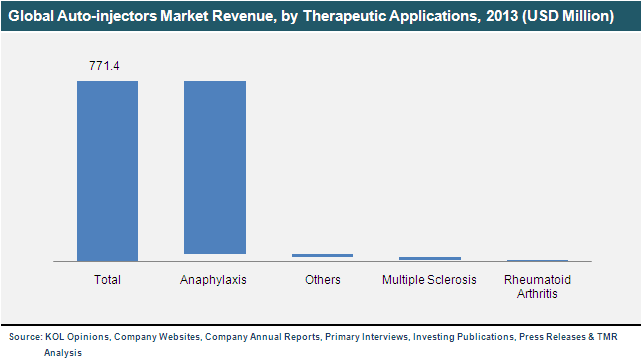 Based on therapeutic applications, the auto-injectors market is differentiated into four segments: anaphylaxis, multiple sclerosis, rheumatoid arthritis, and others. Depending upon the manufacturing design, the global auto-injectors market is categorized into two segments: standardized auto-injectors and customized auto-injectors. Market revenue in terms of USD million for the period between 2012 and 2020 along with the compound annual growth rate (CAGR %) from 2014 to 2020 are provided for all segments, considering 2013 as the base year. Geographically, the global auto-injectors market has been segmented into four regional markets: North America, Europe, Asia Pacific, and Rest of the World (RoW). This section of the report provides market estimations in terms of revenue (USD million) of auto-injectors across four regions from 2012 to 2020. CAGR % for the period from 2014 to 2020 is also analyzed for these four geographies, considering 2013 as the base year. This report also includes recommendations that would help new market entrants in establishing presence and existing market players in expanding their global reach and market share in the auto-injectors market. The report concludes by profiling major players in the auto-injectors market. Company overview, financial overview, product portfolio, business strategy, and recent developments are provided for major market players in the company profile section. Major market players profiled in the report include Antares Pharma, Inc., Becton, Dickinson and Company, Biogen Idec, Inc., Mylan, Inc., Novartis International AG, Pfizer, Inc., Sanofi, Scandinavian Health Limited (SHL) Group, Unilife Corporation, and Ypsomed Holdings AG.